OAO NOVATEK says that Terneftegas, a joint venture between NOVATEK (51%) and Total (49%), formally launched the Termokarstovoye gas and gas condensate field into commercial production. The field is expected to reach its planned daily production level equivalent to approximately 2.4 billion cubic meters of natural gas and 0.8 million tons of de-ethanized gas condensate per annum as early as June 2015. Twenty-two (22) gas condensate wells have been drilled and the field's infrastructure also includes a gas gathering network, a gas treatment unit, and a gas condensate de-ethanization facility. 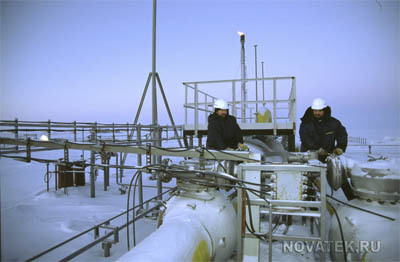 Chairman of the Management Board of NOVATEK, Leonid V. Mikhelson stated: 'The formal launch of the Termokarstovoye field continues our track record of successfully adding productive capacity to our asset portfolio, will have an immediate positive impact on our natural gas and gas condensate production growth and enable us to fully utilize the processing capacities of our Purovsky plant. It is equally important that the Termokarstovoye project has been implemented together with Total, as part of our successful cooperation, which also includes development of LNG production capacities, one of the main strategic priorities for NOVATEK'.